My ultrasound: Very large intramural myomas, one with some central necrosis. 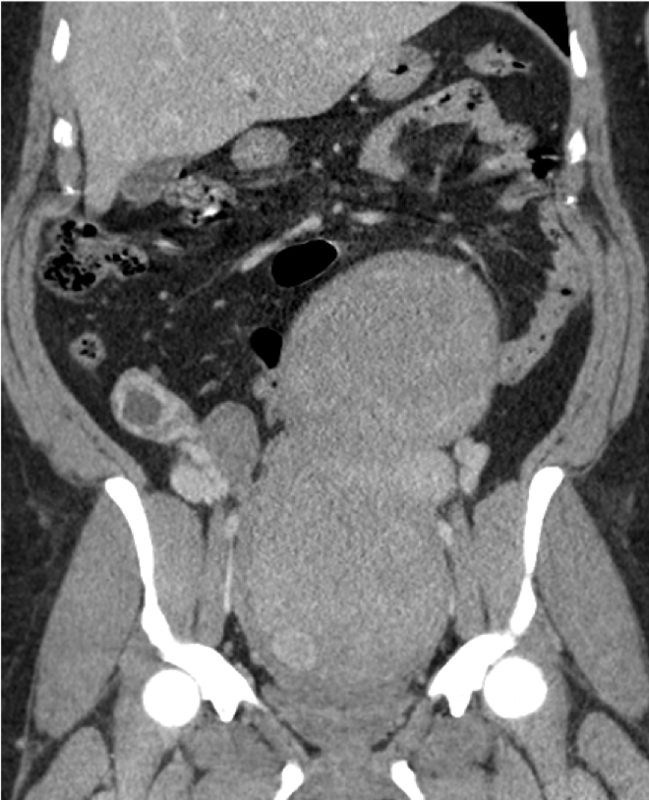 In the lower right abdomen thick-walled cystic structure connected to fallopian tube. 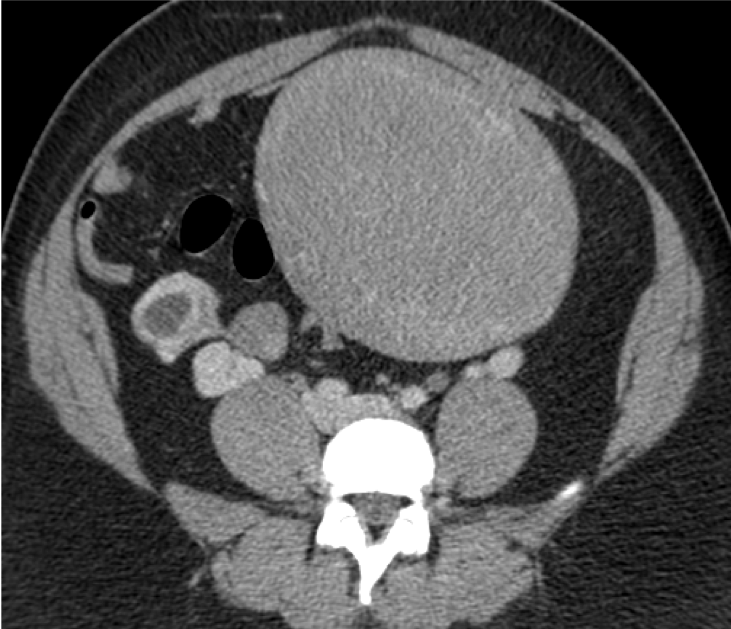 Additional CT with intravenous contrast shows thick-walled extra-adnexal complex cyst connected to the right adnex, consistent with tubal ectopic pregnancy. Furthermore, two very large intramural myomas, which compress the uterine cave. Follow-up: The patient received methotrexate, but it did not work. Then, therapeutic laparoscopic removal of the ectopic pregnancy was performed, with sparing of the tube and ovary due to our knowledge of CT where the exact location was. 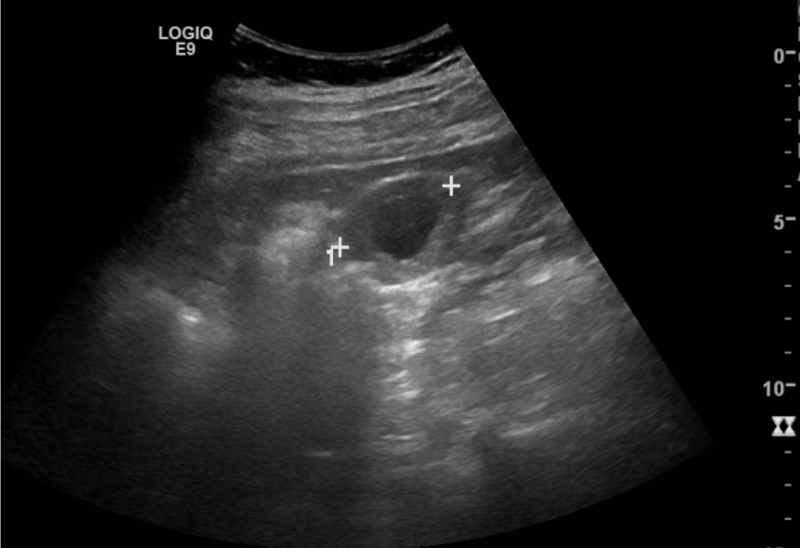 Often ectopic pregnancies present with vaginal blood loss, beta-HCG > 6.000-15.000 mIU/mL and on ultrasound often free fluid in the peritoneal cavity. Teaching point: The absence of free fluid does not exclude ectopic (tubal) pregnancy. Teaching point: Always offer to do a second look ultrasound, even if the gynecologist already performed an ultrasound. Teaching point: Uterus myomatosus does NOT increase the risk of ectopic pregnancy.